Invoking Spell Check immediately begins spell checking of the current document or text selection. 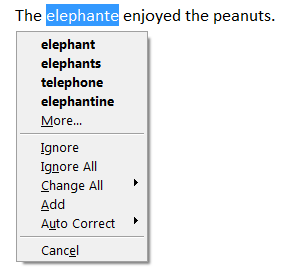 Spell Check highlights the first misspelled word found in the document and displays a menu of available spell check actions for the word. When the chosen action is performed Spell Check immediately proceeds to the next misspelled word. Spell Check can be stopped simply by dismissing the menu either by choosing Cancel, pressing the Esc key, or clicking in the document. 1. Choose the correct spelling from the list of spelling suggestions in the menu. Choose a spelling suggestion from the Change All submenu to change all occurrences of the misspelling to the selected suggestion. The More menu item redisplays the menu with a more comprehensive list of spelling suggestions. 2. Manually edit the misspelled word within the document. Invoke Spell Check (or press the F7 key) to resume spell checking. 3. Choose Ignore or Ignore All if the word is to be treated as correctly spelled. Ignore All treats all occurrences of that word as correctly spelled for the remainder of the Jarte editing session. 4. Choose Add to add the word to the custom spelling dictionary. Once it has been added to the custom spelling dictionary the word will always be considered correctly spelled for all documents. 5. Choose a spelling suggestion from the Auto Correct submenu. The misspelling is replaced in the document with the selected suggestion and the custom spelling dictionary is updated so that future occurrences of the misspelling will be auto corrected to the chosen spelling if the Auto Correct feature is enabled.